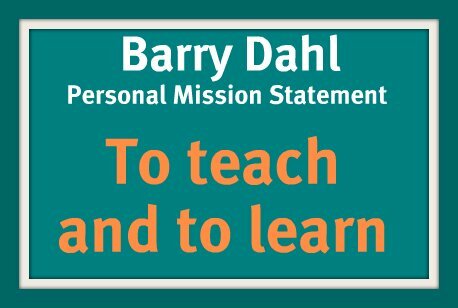 Two things have happened in the past week to make me pay attention again to that strange convention called a mission statement. At Lake Superior College we are reviewing our mission statement as part of our continuous quality improvement process. I have been selected to be part of the writing team for that effort to develop a new set of mission, vision, and values statements. Secondly, I have a career opportunity that will require me to clearly define who I am, what I believe in, what my skills are, and why people should care about any of that. Therefore, I decided it was time to also revise my personal mission statement. It doesn’t really matter what the old one is, but here’s the new one. Yes, I prefer the simple over the complex. I prefer the direct over the indirect. I prefer to now move on to my next task.